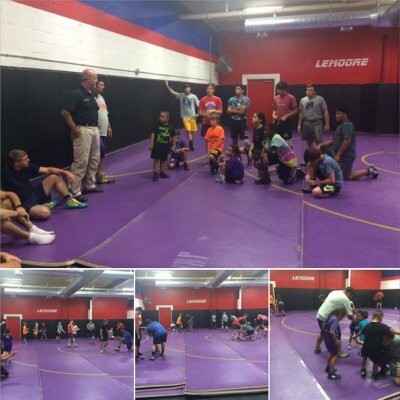 Lemoore Police Department PAL Program offers wrestling to local kids. A lot of talented children and dedicated coaches. A huge thanks to Sgt. Gonsalves and his family, and Officer Gutierrez for all the time and heart you have given to this program. To all the coaches thank you for all your hard work ... We have some champions in the making. The Lemoore Police Department is very excited about its newly formed Police Activities League (PAL) Program which will became operational in July 2015. The program is aimed at reaching out to at risk kids and providing them with direction. The program helps them to make quality choices to become responsible citizens. The program also builds relationships between police officers and the youth. Police officers are a role model for the youth and work with the youth of our community individually and as a group. The PAL program provides for not only athletic activities but also serves to place an emphasis on education. PAL works to provide all kids with the same opportunities as everyone else and is designed to discourage participation in gangs, drugs, and violence. The PAL Program also teaches respect for others and works to keep kids in school by placing a great value on education. PAL Programs have been around for nearly a century and started in New York City. The New York City Police Department recognized that many of the youth who had no alternatives to being “in the streets” and were in need of structure and guidance to avoid becoming involved in criminal activity. At risk youth were not getting the attention they needed in the community and from the police department as role models. PAL Programs are nationally recognized with thousands of programs in effect. The program is again designed to reach “at risk” kids ages 5 to 18. These at risk kids are not necessarily bad kids or kids that have been in trouble. At risk kids are simply that, they are kids that are, based on many situations or circumstances, at risk of going down the wrong path and ending up involved in gangs, drug activity, acts of violence, or other criminal activity. These are kids at a crossroad and we as a community and your police department need to get involved to help these kids feel that they are valued by the community and have a bright future because someone cares about them. We are committed, with the support and partnership of the community, to making this program a success. Anyone having questions or wanting more information on the PAL Program is encouraged to contact me at the Lemoore Police Department at (559) 924-9574. What is the age requirement and are male and females welcome? The age requirement is 5-18. Both males and females are welcome. How does one get their child involved and what is the cost? The cost is $40. This includes one year registration and uniform. Do you have to live in Lemoore to participate? You must live in Lemoore or attend a Lemoore School. You can fill out a PAL Wrestling Application and someone from the PAL staff can provide further information. Sponsors are always welcome. You can call our office (559) 924-9574 for more information. Tuesdays and Thursdays from 5:30 to 6:30 pm.